Andhra Pradesh SCERT and CSE, Amaravathi introduced the latest objective type summative assessment. This academic year 2017-18 introduced this objective type examsAP SA1 Objective Type Model Papers 2017 for 6th to 10th Classes – Telugu, Hindi, English, Maths, PS, Biology, Social CCE Summative Assessment 1 / SA 1 Model Papers AP and TS – 8th, 9th, 6th, 7th, 10th Classes AP TS SCERT SA1 SA2 SA3 Model papers. Andhra Pradesh and Telangana High School SA 1 Summative 1 Model Question papers for 6th 7th 8th 9th 10th Classes All Subjects –Telugu, English, Mathematics, General Science, PS, Biology and Social Question Papers are available here. 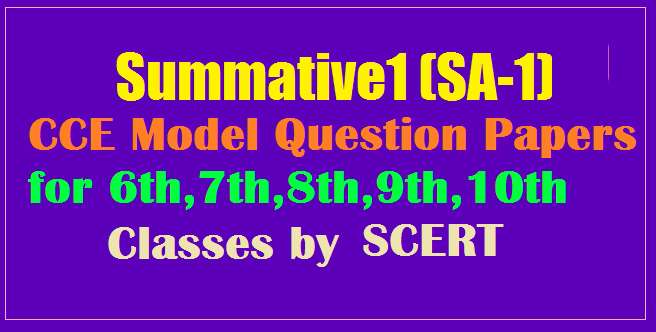 Download Summative 1 SA1 Model papers From Below Links both medium i.e., Telugu medium and English Medium Summative Exams Objective Model Question Papers download.